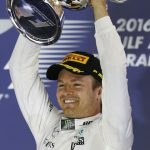 Nico Rosberg, recently crowned world champion in Formula 1, declares that he leaves the category. Bomb. Only this way can we say this piece of news, the most important of the day, the month, and even the year. Only 5 days after being crowned world champion in Abu Dhabi and few hours before receiving his title in the FIA gala in Viena, Nico Rosberg announces that he leaves Formula One. Once achieved the world championship that he was wishing, the German makes a step back in F1, where he has been competing during 11 years. He has the feeling that he has nothing to win anymore. Nico be able to focus completely in his personal life, especially his child and his wife Vivian. I feel blessed, my wife is full of emotions. Thank you everyone for the support during this years.